Pictured here on our BS1063 Hurricane Chamberstick, not included with purchase of replacement glass. Please measure your candle holders very carefully prior to ordering. Even 1/8 inch difference in diameter can cause the glass to not fit. Base diameter measurements are outside edge to outside edge of the glass. 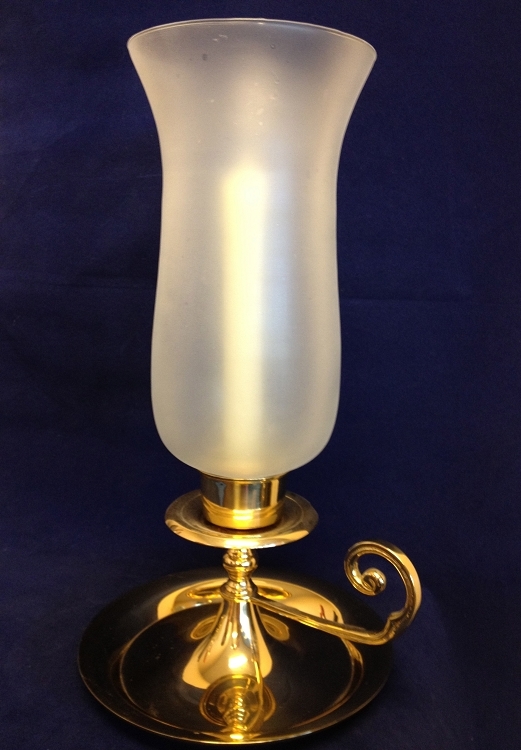 We just love the soft glow that results from burning candles in lamps using our lightly frosted hurricane globes! Without the adhesive foam wrap, the base measures 1 1/2", and the globe is also available in 1 5/8" base diameter when using the foam wrap. The EC1001F globe stands about 9 3/4 inches tall including the one inch fitter base with a top diameter opening of about 4 3/4 inches. Weighs 7 ounces. Feel free to call or email us if you have questions regarding accurate measuring for replacement glass. Please be aware that all of our glass products are blown glass, therefore, they may vary slightly from batch to batch. Imperfections will be present, and are considered normal. Please note that when ordering the 1 5/8" inch diameter globes, the bases will come wrapped with adhesive foam to cushion and secure the glass in your hurricane socket. If you are ordering a smaller base diameter, we can include strips of the adhesive foam upon request. Just indicate that you would like us to include foam strips in the comments box during checkout. They came quickly and were exactly what I was looking for. The look beautiful when lit. I highy suggest this company. Q: For the 9" Frosted Trumpet Hurricane Globe, what candle size do you recommend? 5", 6" or 7" high? A: You can use candles of up to about 8 1/2" inches in height, provided they are the standard 7/8" diameter.